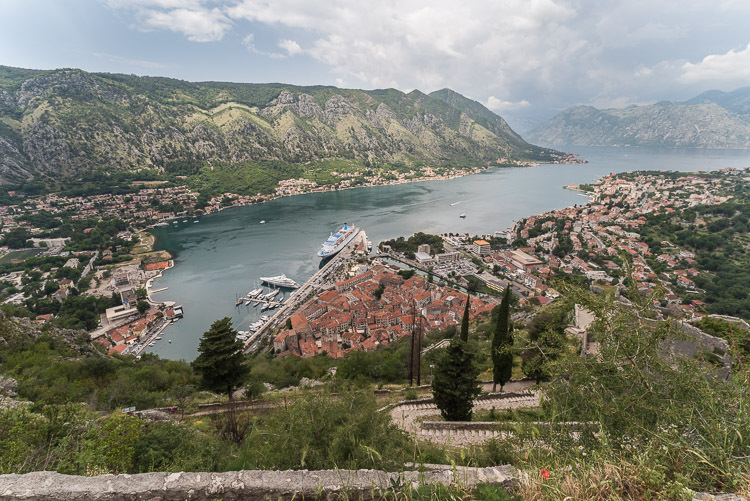 The ancient town of Kotor, here seen from two opposite directions, sits deep inside a fjord-like bay relatively far from the open waters of the Adriatic Sea. 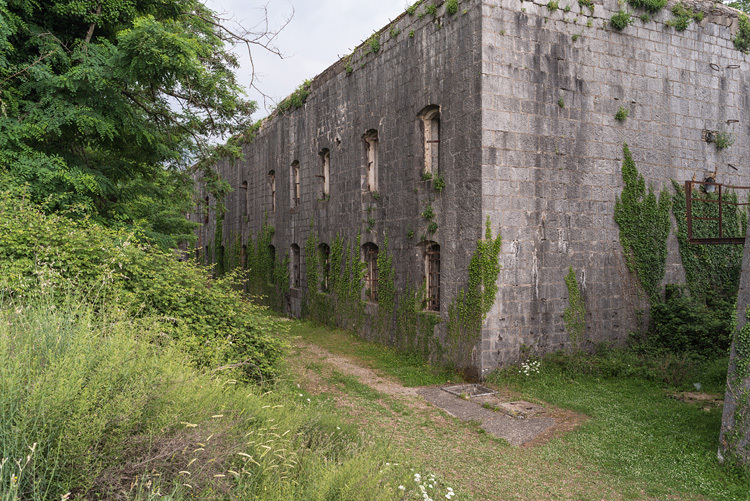 A closer look at the old center inside the Venetian fortifications. 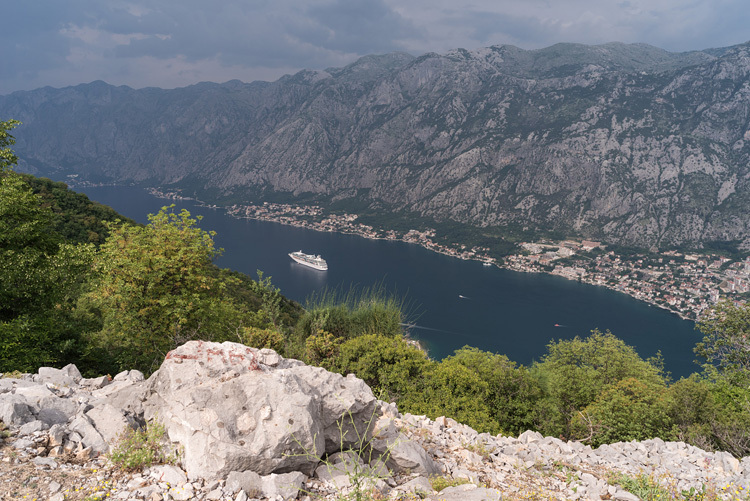 The cruise ship anchoring in front of the city dwarfs the "mighty" fortress walls. 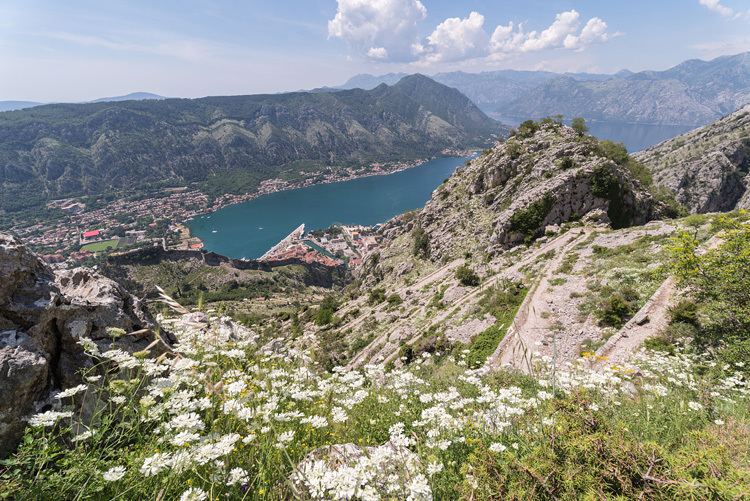 A path leads up the mountainside above town, offering breathtaking views for those willing to climb up. Not only the stone, also the weather turns against us on our way down in the afternoon. 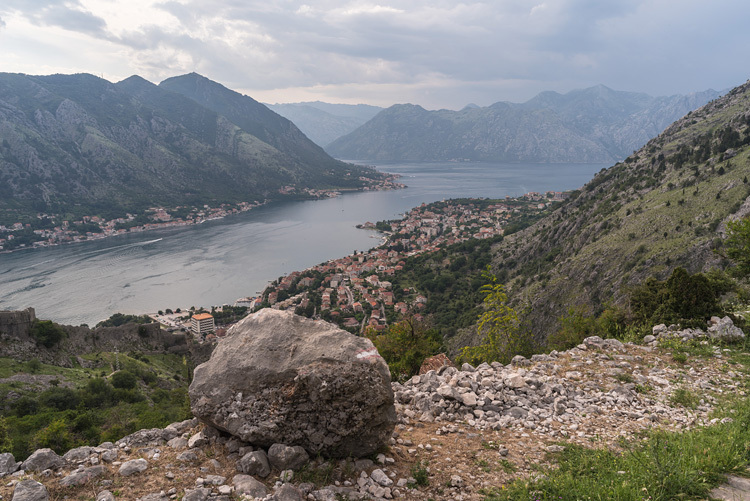 The landside of Kotor is also protected by walls that cover the whole of a rocky hill lying behind the city. 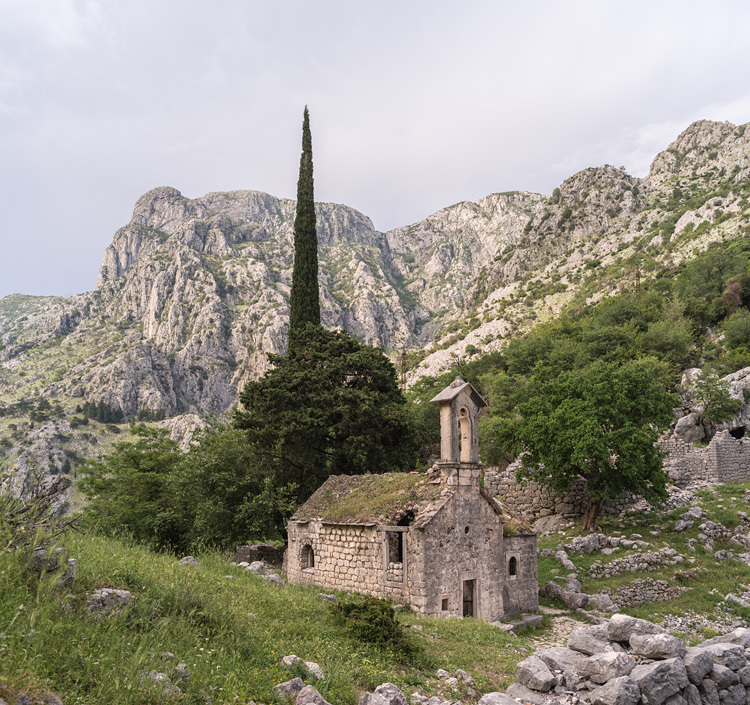 This small chapel is in a pitiful state, but not beyond repair. 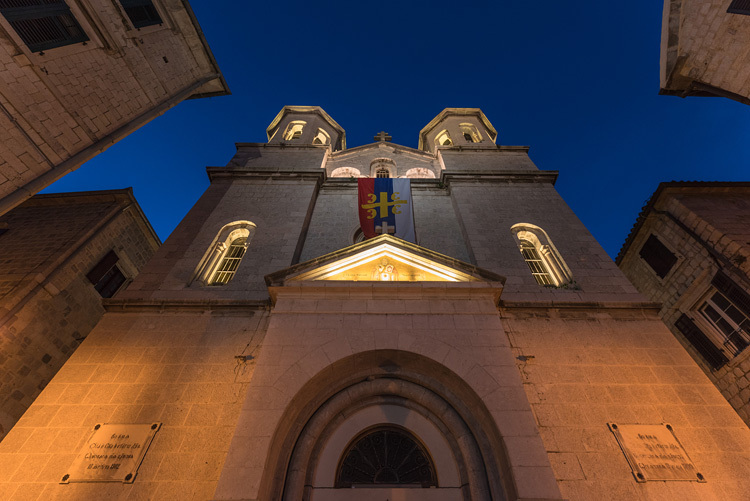 The church presents itself as a face-saving target for those tourists, who start to feel themselves wary on their way up inside the fortress. 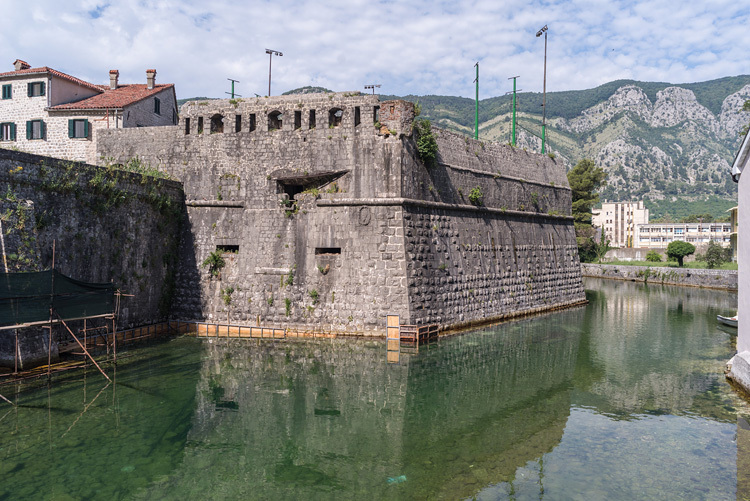 The city wall along the Skurda river, a rather short river, springing from the karst and already entering the bay just after half a mile. 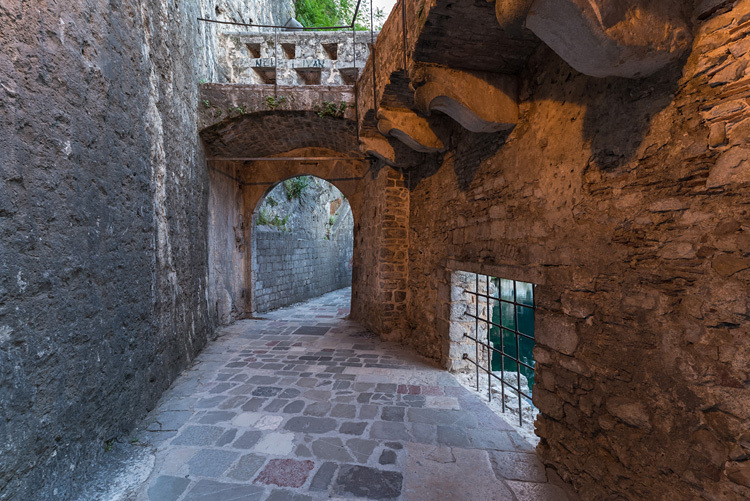 The Gurdic gate on the eastern side of town, one of the few openings in the wall. 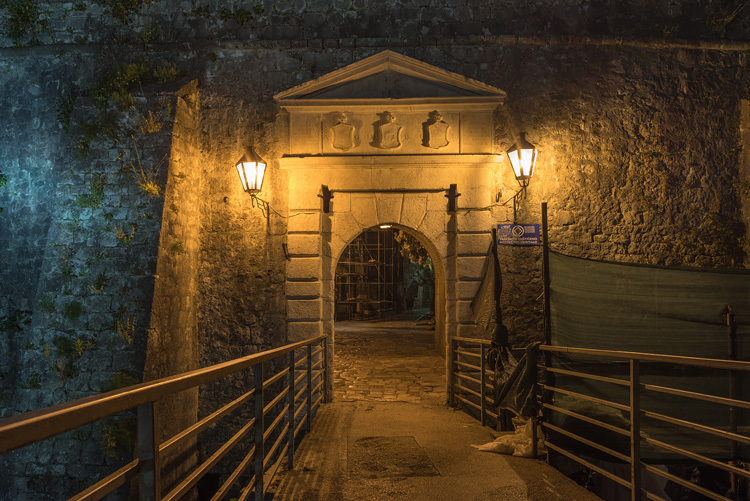 The Gurdic gate and bastion from outside. 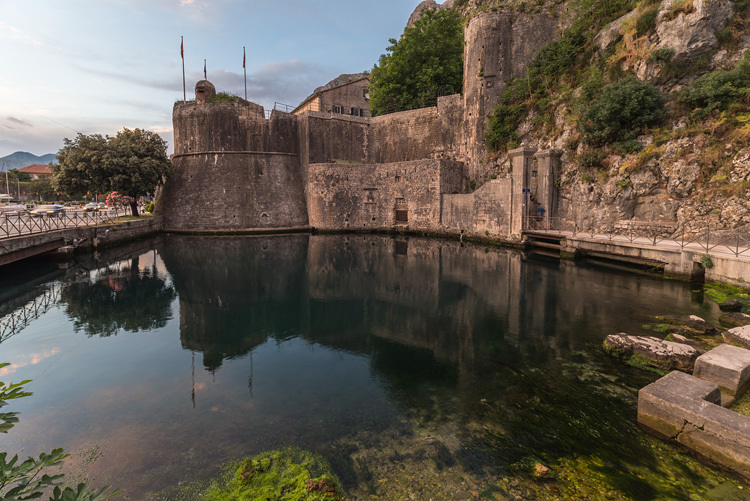 A freshwater pond enhances the military value of the fortification, fed by one of the many karst springs. 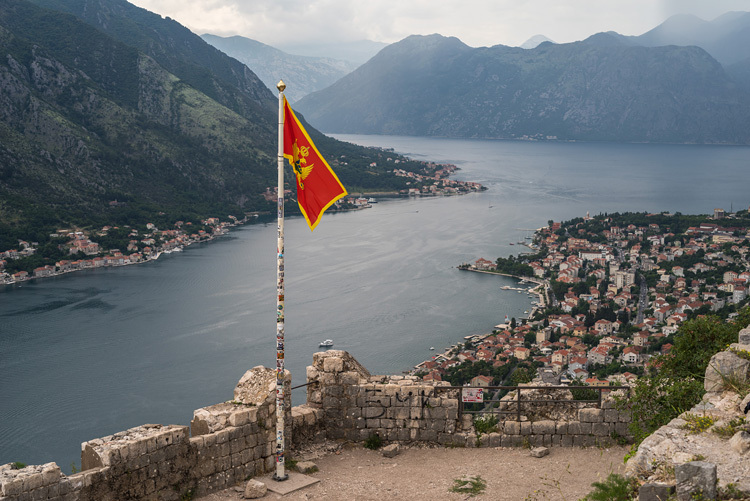 The Bembo bastion protects the western side in cooperation with the already mentioned Skurda river. 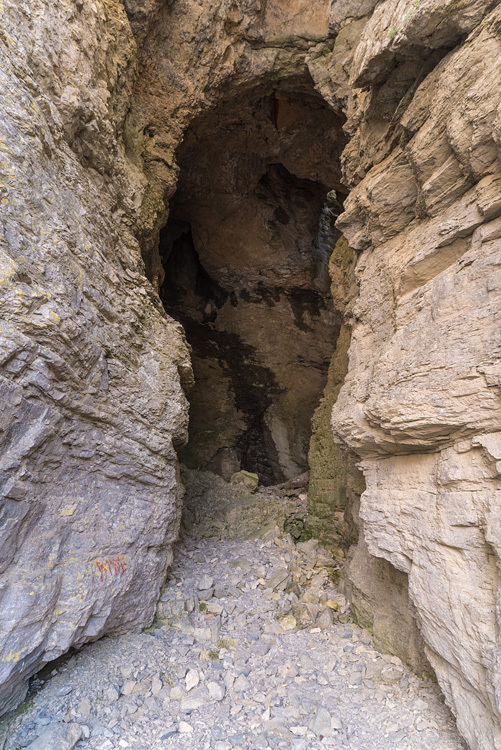 The gate on the western side is the River gate and accessible only over a bridge. The third and last gate into town is on the sea side. Guess how it is called? 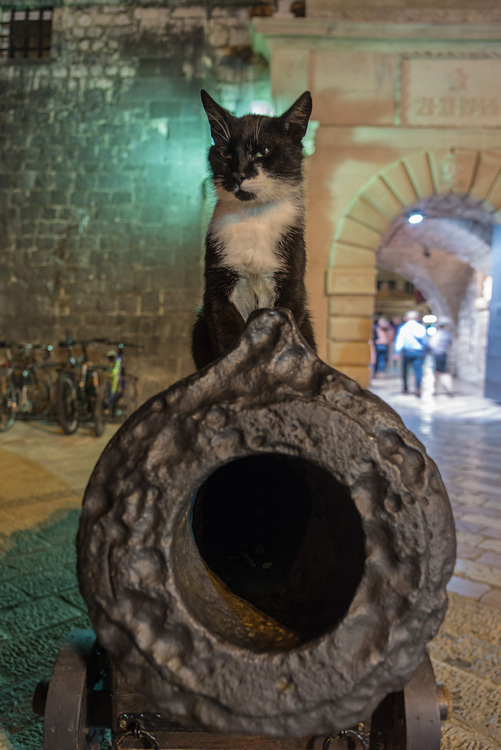 Kotor is a city of cats even offering a cat museum. The cats also man the cannons at night. A full moon has risen over Kampana tower. 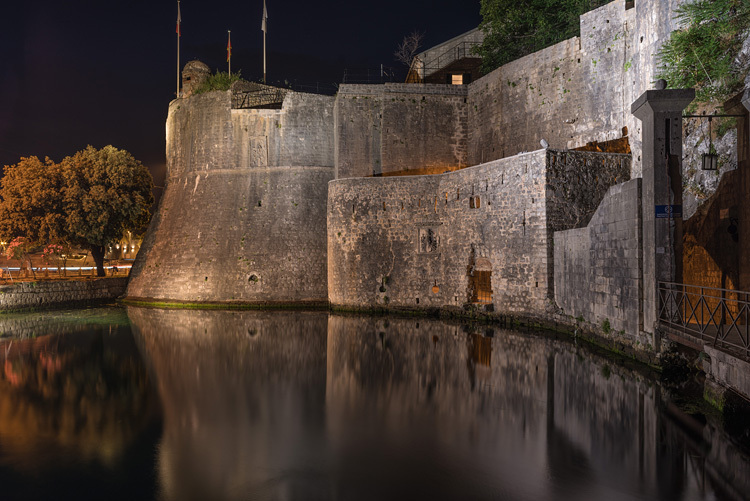 The upper fortress wall is illuminated at night. 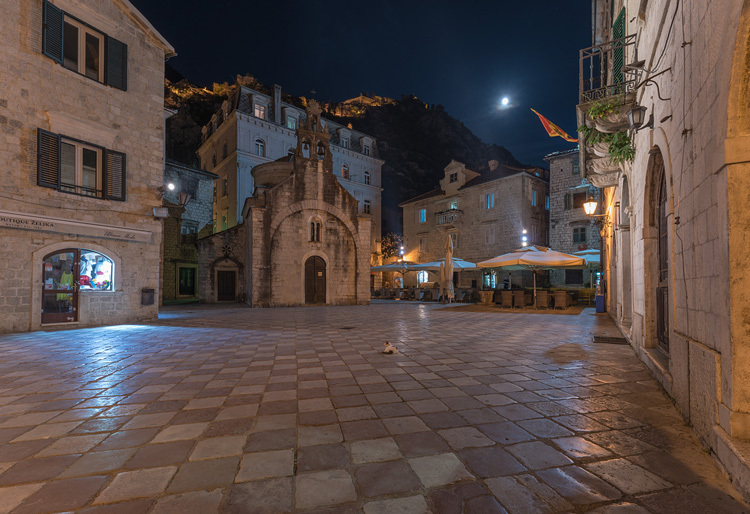 The night has no power over Kotor, everything is well lit for tourists, and photography continues after sunset. 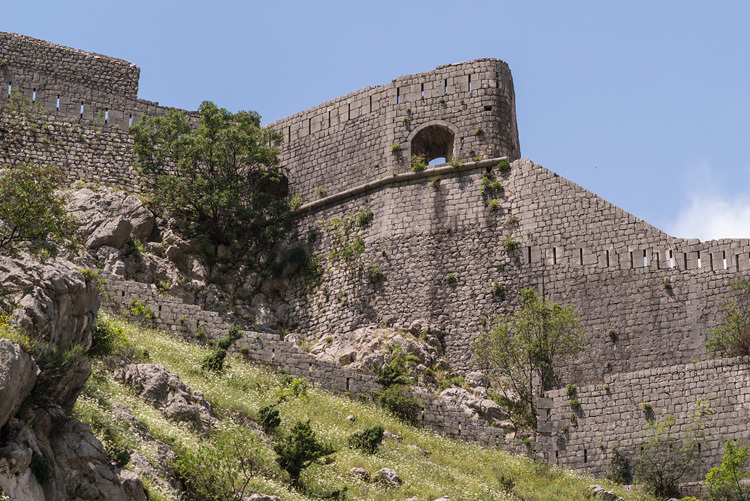 The wall of the fortress covering the town from the landside looks as if it was built with the enemy already in sight. 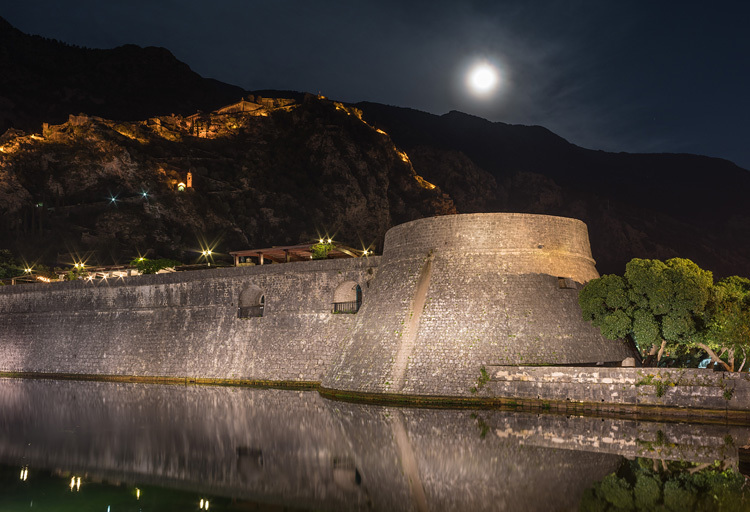 One of the many fortifications found in the area of Kotor, this one built in the Austrian period. 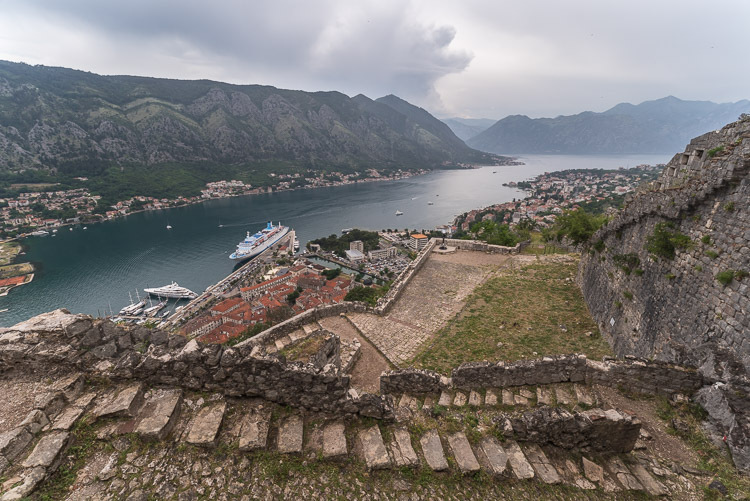 At the fortification's highest point waits the Castle of St. Giovanni for tougher tourists ready to climb up the many steps. And also rich enough to pay the 8 Euro fee. 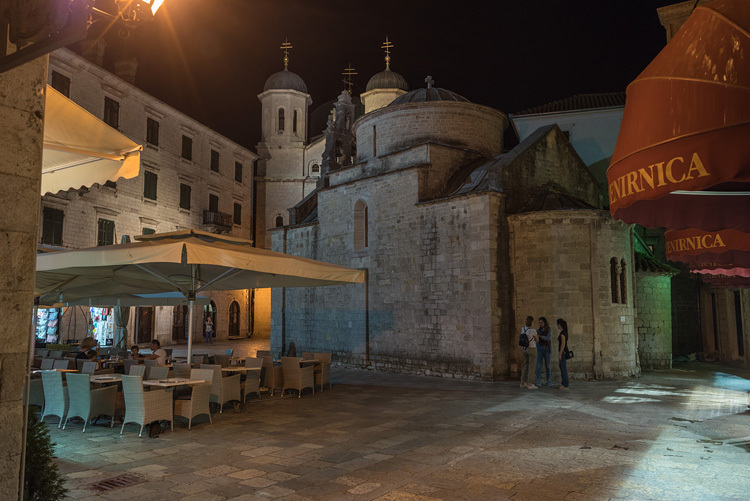 A little church dedicated to Saint Luke gives this square its name. Note the cat in the middle. 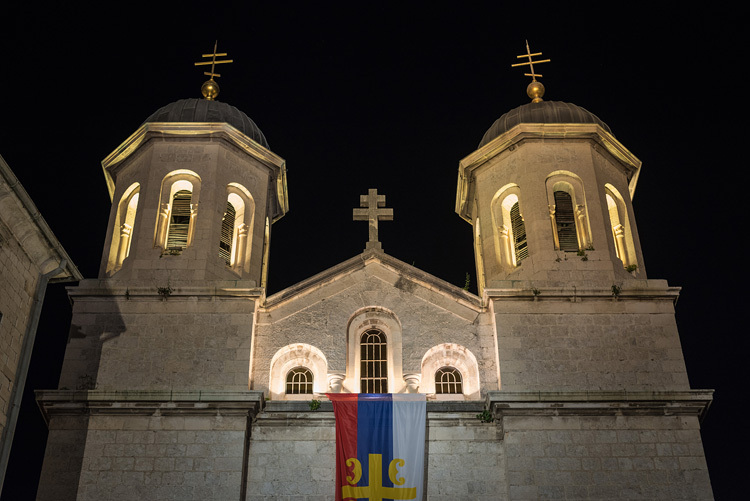 The same church, only from the other side. 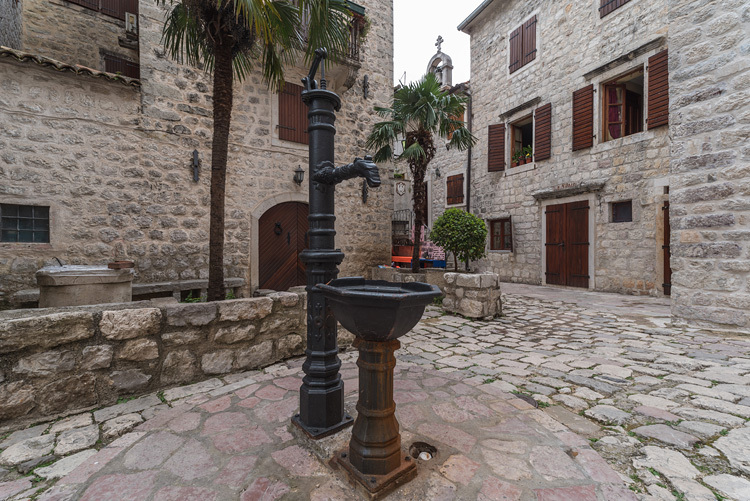 With the many karst springs it was never a problem to supply the city with fresh water. 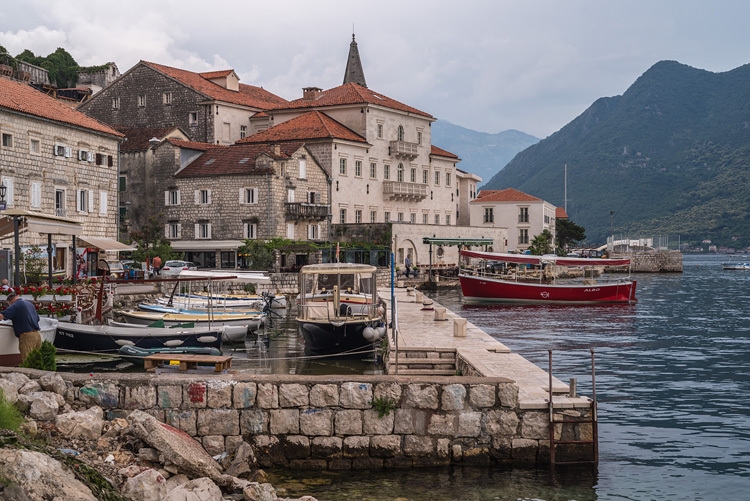 Perast is a popular old village within the Bay of Kotor. 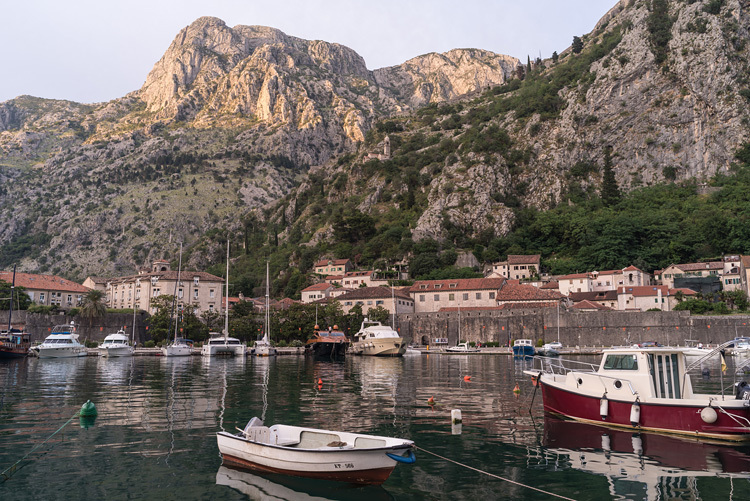 Another, not so popular village in the Bay of Kotor. The slope faces to the south and we had to step over a dozen snakes that day. 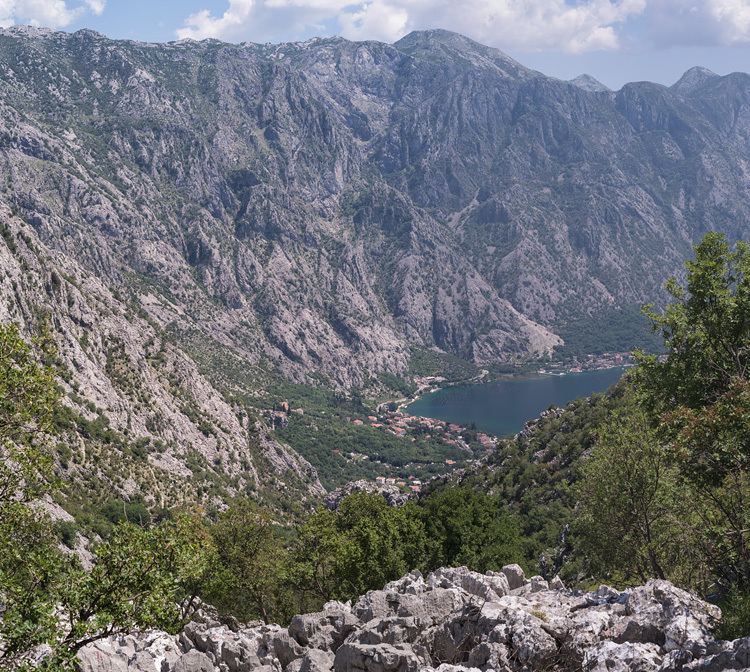 Karst rock favors the formation of caves, this one high above Kotor on the road P1. 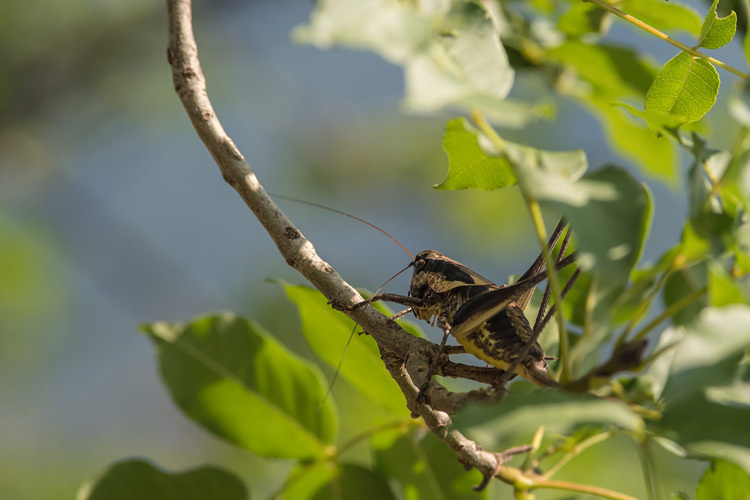 The many jumping grasshoppers made early detection of snakes difficult. 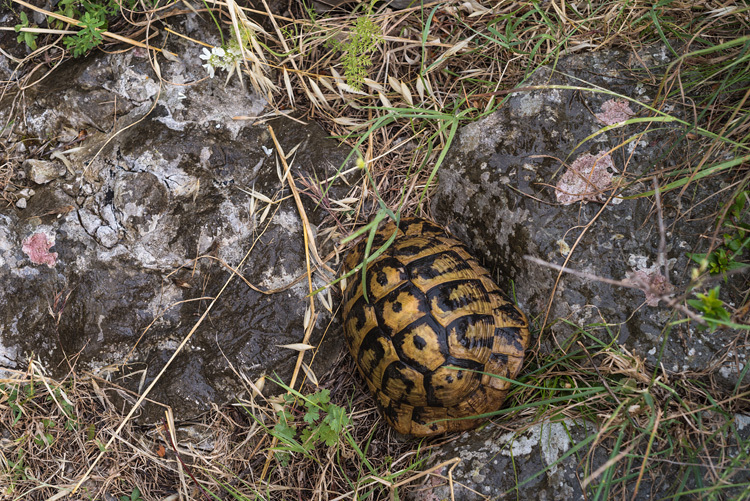 At least this one didn't jump around. 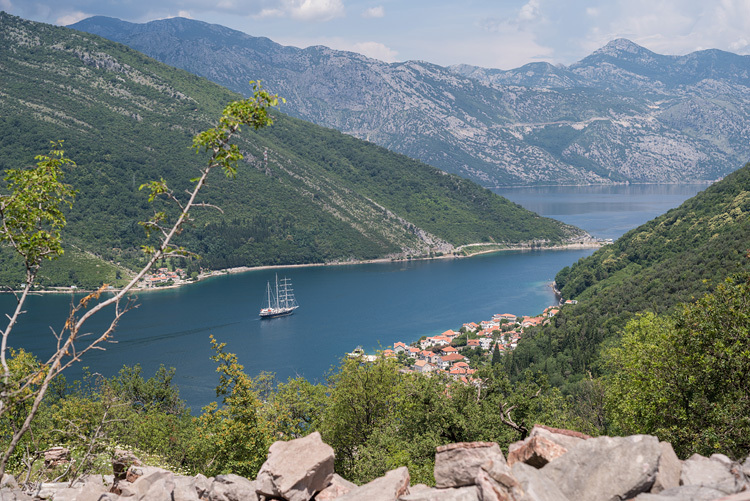 A channel of just about 300 m width leads into the inner Bay of Kotor. 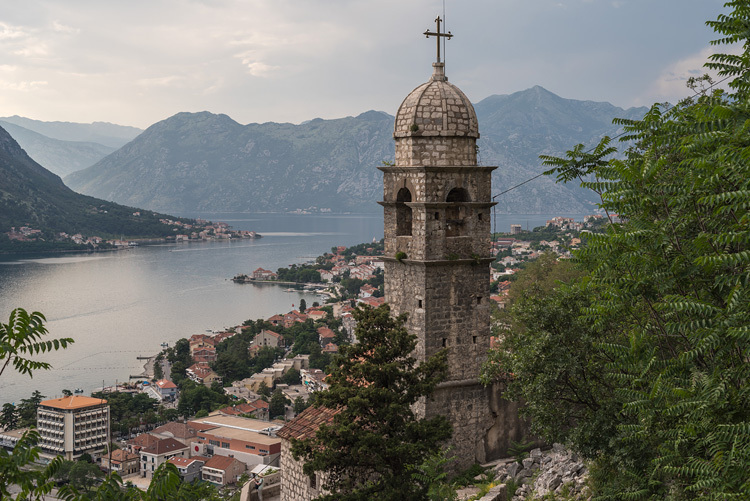 A view at Kotor, situated at the very end of the Bay. 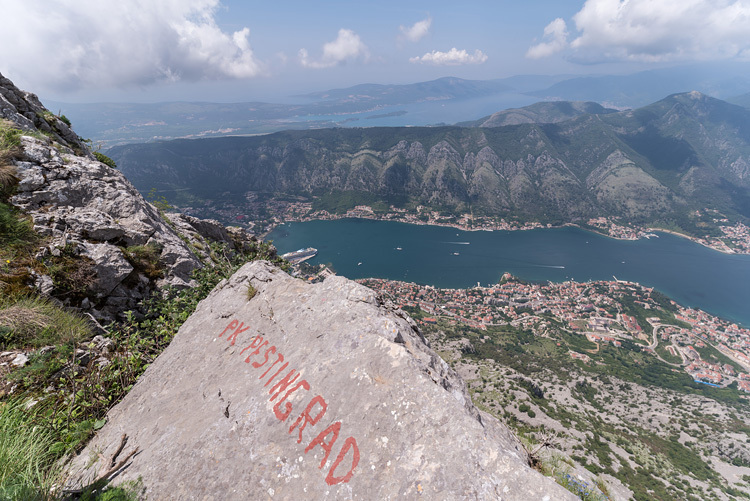 Pestin Grad, a rock about 1000 m over Kotor, offers the best view over the area. 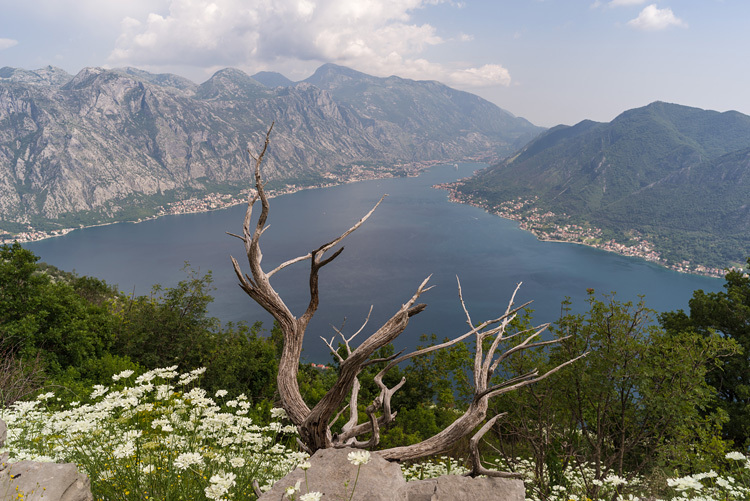 The Bay of Kotor from the other side. 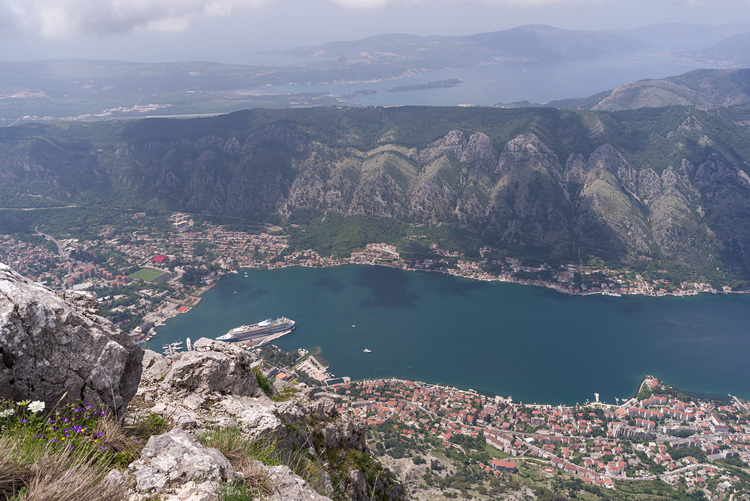 Yet another one look from Pestin Grad, showing the distance to the Adriatic Sea and how deep the Bay of Kotor is cut into the mountainous land. 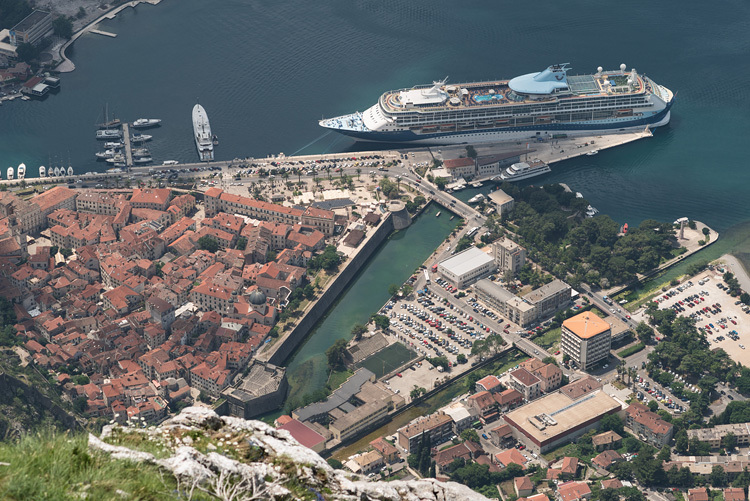 A cruise ship has occupied the city. If more than one arrives, it has to drop anchor in-midst the bay. 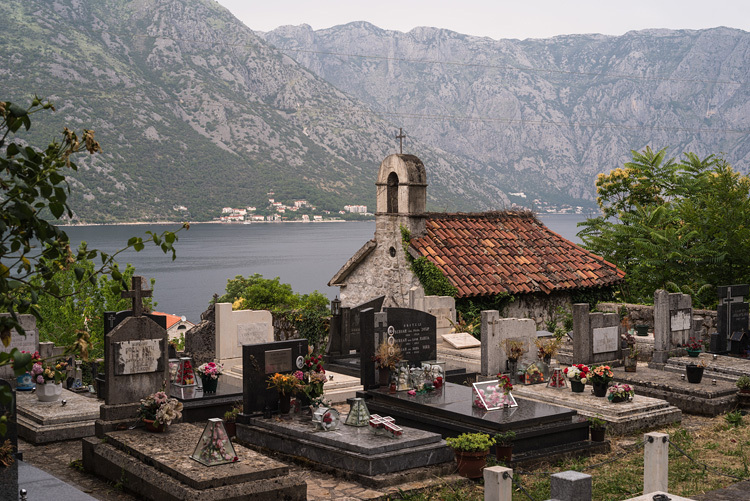 A small chapel and the cemetery of the village Donji Stoliv. 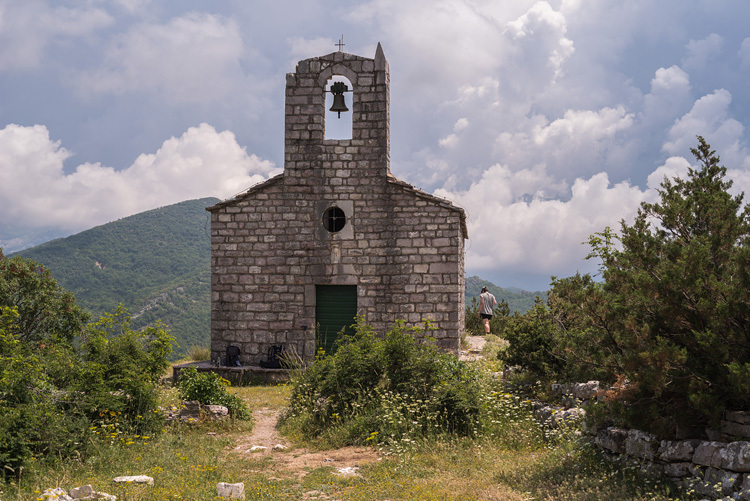 The old chapel of Saint Vid high over Lepetane, built in the 14th century. 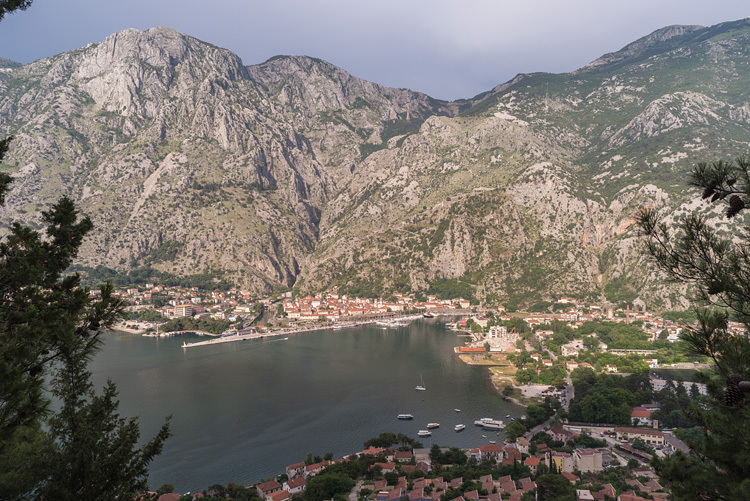 Kotor from a restaurant during sunset on our last evening. 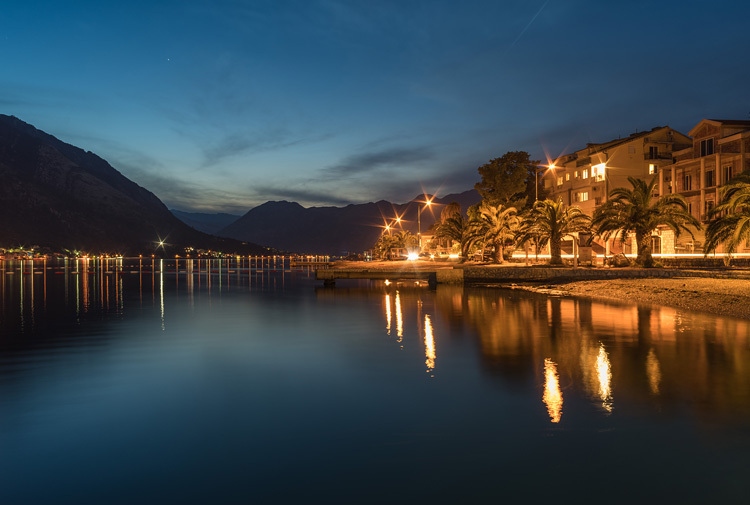 The Bay of Kotor at night, also from a restaurant. I recommend the local wine, you won't regret it. 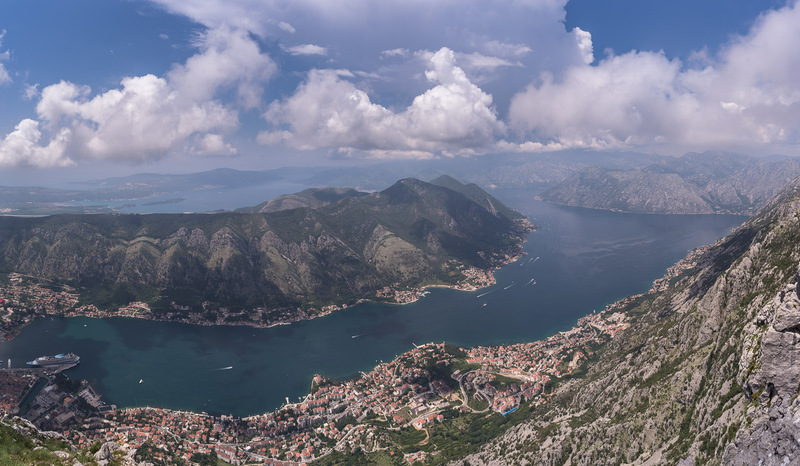 The whole (almost) of the Bay of Kotor from the mountain of Pestin Grad.